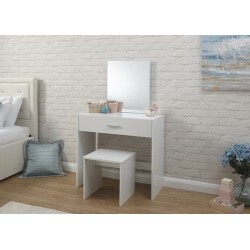 Dressing Tables There are 102 products. 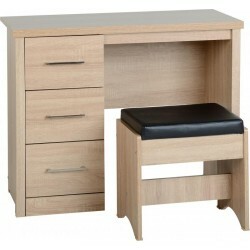 The Dressing table is made by Particle Board & Veneer,The Ottawa dressing table features three deep drawers which will enable you to keep your bedroom clutter free,Available in Different Colors.Whilst also providing you with a practical piece of furniture which will enable you to make yourself look totally glamorous for the day or night ahead. 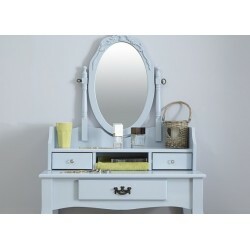 The Dressing Table is made by Solid Pine, Rubberwood & MDF,This Loire dressing table and mirror set features Queen Anne style designer legs and also features two drawers. 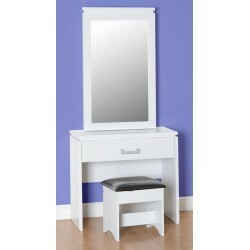 complimented with an oval adjustable mirror and beautifully finished matching padded stool. The Dressing Tableis made by Paricle Board, Our new Keswick range is available in either a cream or black high gloss finish. 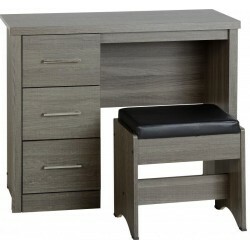 Available in different colors.The carcass is finished with a durable ‘scratch free’ melamine. 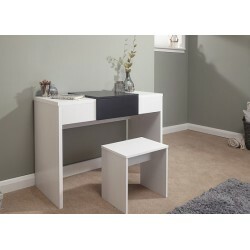 Keswick’s smooth, clean and modern design will look great in any bedroom.